Born on June 28, 1920 on the Vaudeville circuit that traveled up and down the East Coast performing as they went, Don McNally attended 306 schools before he graduated from high school. He went on to become one of the early pioneers in the drive-in movie industry and one of the founders of the Derby-Port Drive-In Theatre in Derby Vermont, and the Morrisville Drive-In Theatre in Morrisville, Vermont. McNally passed away on October 21, 1990, but not without leaving many memories that people cherish. Many of those memories center on the two drive-ins. He had the foresight to keep many mementoes of his life in his personal archives. And in his dying days he sat down with his friend Duncan Kilmartin of Newport and completed an audio recording of his life. 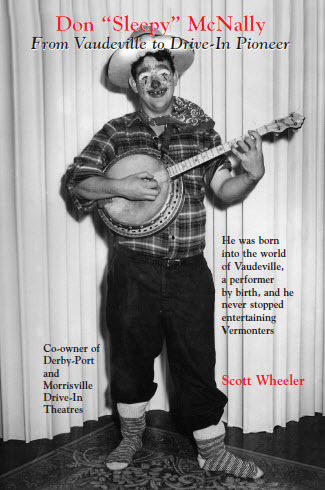 Using the recordings, McNally’s archives, which include dozens of photos of his life from his Vaudeville days to drive-in owner, and with the help of his widow, Irene, and their three grown children, author Scott Wheeler of Derby, Vermont, has completed a book on McNally’s life. Don McNally: From Vaudeville to Drive-In Pioneer looks into the life of Don McNally and the journey from his birth into a show family, his own years on the stage, his war years, and his work in the drive-in movie world, including being one of three men who owned the two drive-ins. The 128-page book is filled with dozens of photos, mementoes, and memories, sells for $10.00 (free shipping and handling in the U.S). The photos alone make this book a real keepsake. or send a check or money order to Vermont’s Northland Journal, P.O. Box 812, Derby, Vermont 05829.